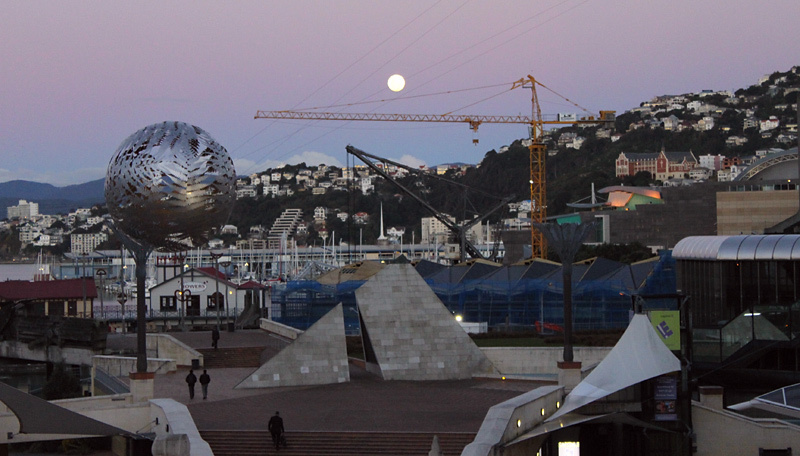 Wellington provides some exquisite contrasts between the natural landforms – the hills and harbour, and the man-made architecture and engineering. Add in some art, and the people themselves, and the combinations can be very interesting – at times even beautiful, especially in the early evening with the moon rising. It can be so lovely. 20. Every day say thank you. 25. Every day your light shines for others to see. 29 Aug This entry was written by Lynsey, posted on August 29, 2010 at 9:10 pm, filed under architecture, creativity, exploring, gratitude, landscapes, love, public art, sculpture, seeing, technology, weather, Wellington and tagged architect, art, engineer, engineering, evening, harbour, hills, love, moon, people. Bookmark the permalink. Follow any comments here with the RSS feed for this post. Post a comment or leave a trackback: Trackback URL. Home is definitely where the heart is! I love this view – Wellington ROCKS!!!!! !